In 1940 I did a conversion course from flight Mechanic to Fitter. At the end of the course, one tradesman came to me and said that he didn’t want to go to the Shetland Islands. I hadn’t been posted at the time so I arranged to swop places with him. A week later I arrived at Sullom Voe, site of the present oil terminal, where a Sunderland Squadron (201?) was based. The station consisted of a collection of wooden huts, and that’s about all, apart from a lot of sheep. Accommodation wasn’t exactly luxurious. We slept on the floor on straw palliasses and each hut had a single coke stove for drying clothes. The flying boats were moored in the Voe and special cradles attached to the wings were used to facilitate engine servicing. It wasn’t unknown for tradesmen to fall off these cradles into the water. I once saw a luckless rigger, working high on a Sunderland fin, fall off his perch and bounce off the tailplane and into the Voe. I thought that, if I’ve got to get wet, I might as well do it properly so, after about a month at Sullom, I volunteered for the Air Sea Rescue base at Lerwick. The base had two 65 feet high speed launches, both British built boats fitted with three Napier Lion engines driving 3 screws. They were both good boats and could make 35 knots or more, although normal good weather speed was nearer 25 knots. The weather was usually pretty rough and often quite ferocious. We were sometimes down to 10 knots when the boat was being thrown about. On one Fair Isle trip we brought off a Naval Officer who said that he had served on submarines and surface ships but never before on both at the same time! Severe weather was pretty common between Fair Isle and Sumburgh Head. Fair Isle is very small and shaped like a dumb bell. There’s a promontory at the north end called Sheep’s Crag which rises almost vertically hundreds of feet out of the sea. The harbour was just a concrete slipway and difficult to approach because of rocks. We were sent to pick up what was left of a Heinkel crew which was shot down by a Spitfire from Sumbergh. Two of the crew were killed while trying to leave the aircraft as it bounced over the ground in a wheels up landing. The other three crew members stayed with the aircraft until it came to rest and were uninjured. The aircraft was burnt out. I remember the trip very well. The Shetland Forces came under the Senior Naval Officer and were known as HMS Rex. We were ordered out in atrocious weather. How a 65 ft launch could be expected to cope with these conditions remains a mystery. However, we managed to struggle to our destination, embarked the three prisoners and set course for Bressy, an island opposite Lerwick. We never got clear of the island and were soon driven back. The three Germans were landed again and we managed to turn the boat’s head to the weather. The engines were kept running throughout the night into the next day and were opened up to meet each successive sea. In that way we were able to stop the launch being washed ashore. The next day the skipper made a decision to move to North Cove. Out again in heavy seas, it was impossible to round Sheep’s Crag so the skipper then made for South Cove. We were slowly heading for the shore when she suddenly stopped. She was on a rock which had punched a hole about a foot square in the smallest room in the ship. The next sea carried us off and we headed for the shore with a bent propeller shaft banging on the bottom. She struck head on and the next sea carried us broadside and threw us onto the beach. We all got away from the boat by scrambling down escape nets which had been thrown over the sides. I was on the island for almost a month, others stayed longer. We were accommodated by the navy who were manning a wireless station. I think they were using some form of radar by the look of the aerials. Our wireless operator knew about it but he wouldn’t say anything. And the navy guys were like oysters. So I never did find out what was going on. I returned to the Shetland Mainland in a little wooden ship called the Good Shepherd. At that time she was the only link between the Shetland Mainland and Fair Isle. For some reason known only to him, the skipper insisted on leaving me on Sumburgh Head where there was no proper landing place. I had to climb up some huge wooden piles before I could get on to the land. As soon as I felt the grass under my feet I knew that I was on an airfield because a Blenheim was just landing quite close to where I was standing. Not only that, it was dragging its trailing aerial which hadn’t been wound in and which came bouncing and snaking over the grass at an angle to aircraft. It had a lead weight at the end of it which I had to jump over. Our living quarters were cosy enough when compared with the straw palliasses at Sullom. The accommodation had been used by women fishery workers who came to Lerwick before the war for the herring season. Our duty watch lived on board where we did some cleaning or painting to make the launch look pretty. The wireless shack was very small and just about fitted some occupants. One day there was a particularly large Wop and the radio room didn’t just fit him, it fitted him like a glove. Outside on deck, a couple of the crew were messing about with a rifle when it went off and a bullet went through the door of the wireless shack. The man with the rifle stood still and went white and the rest of us stopped breathing. After a minute or so, somebody entered the shack to find the Wop still tapping away on his key, unaware of what had happened. We were able to trace the path of the bullet and decided that it must have passed between his legs. Lerwick wasn’t a bad posting in many ways. There were very few hours of daylight in winter and in summer it never got dark. The Northern Lights were always fascinating. There was a cinema and a dance hall, both well attended. The Naval Canteen was another popular place. I don’t know how strong the beer was but nobody began to sing until they’d had eight! We ate Kit Kat chocolate biscuits with our beer – there seemed to be no shortage of them at that time. We had a cigarette and tobacco ration which we had to pay for and sometimes we received a free issue of ‘Cape to Cairo’ cigarettes. They were murderous but they were smoked anyway. There were one or two hotels in Lerwick but no pubs as such – the place was officially dry. A bottle of whiskey could be had from one of the grocers in the Main Street – you paid him 17 shillings and 6 pence and came out with a bottle tucked under your coat! I remember coming in to Aberdeen harbour in the Lochnager after a night crossing from Llerwick. Most of us were below deck getting ready to go ashore when there were powerful but muffled explosions. The ship and everything in it shook and shuddered. As the vibrations ebbed away, we went on deck and were told that a German aircraft had lobbed a couple of bombs into the harbour. A Shetland posting had certain advantages. Because of travelling delays, a fortnight’s leave could last up to a month or more. We had to use ordinary train and steamer services. These long delays in Aberdeen must have bothered someone because, towards the end of 1941, two fast and reliable steamers appeared on the scene. They could cross to Invergordon in less than 12 hours. Special trains were laid on and we could go from the ship into a waiting train. This arrangement finally put paid to the extended leaves. The new system didn’t affect me very much. I was working on the launch when a brass splinter got into one of my fingers. It was extracted but it led to disorder of some kind which put me in Lerwick Hospital for 47 days. After a fortnight’s sick leave, I was posted to 30 MU at Sealand. I was back on my old stamping ground here, having served on the base as a flight mechanic before converting to be a fitter. I hadn’t been at Sealand long before being posted to an Army Cooperation unit at Cleave, near Bude in Cornwall. Whilst at Cleave, I volunteered to be a Flight Engineer. There were no formalities, no interviews, no aptitude tests and no aircrew medical. The Station Medical Officer gave me the once over and that was that. I was posted to St Athan for a 10 week course. At the end of the course I was posted to Swinderby where I spent a couple of weeks doing nothing. One day, a volunteer was called for to go to Waddington. I volunteered, nothing was explained to me and I was simply told to go to Waddington for a couple of weeks. Transport was provided. 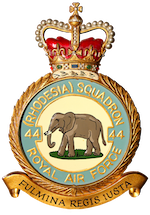 When I arrived on the station, I found that I was a member of No 44 Squadron, with a blank log book in my hand. It didn’t stay that way for long. The next night, 2nd September 1942, I was on my way to Karlsruhe in Lucky Wright’s cockpit.